In a medium skillet, warm 1 Tbsp. olive oil. Saute the green onions/shallots and minced garlic. Do not brown the garlic. In a medium bowl, mix together the lemon zest, Italian parsley, chives, pepper and salt. Place the halibut fillets onto the mixture and coat all of the sides of the fish. Place the herb-coated fish into the olive oil-shallots-garlic mixture in the skillet. Toss in any remaining herb mixture to the skillet. Cook the fish for 2 minutes on each side or until slightly golden. Place fish in an oven-proof dish in the hot oven while preparing the rest of the ingredients (for the sauce). In the skillet that the fish was cooking in, place the prosciutto slices in whatever onions, garlic, and herbs remain. Remove prosciutto and put to the side. In the skillet, add the wine. Cook the wine down to about a quarter cup of liquid. Add the butter, cream, lemon juice, and the capers. Re-add the prosciutto slices back into the sauce and warm. Adjust the ingredients to what you prefer. Remove the fish fillets from the hot oven and plate them. 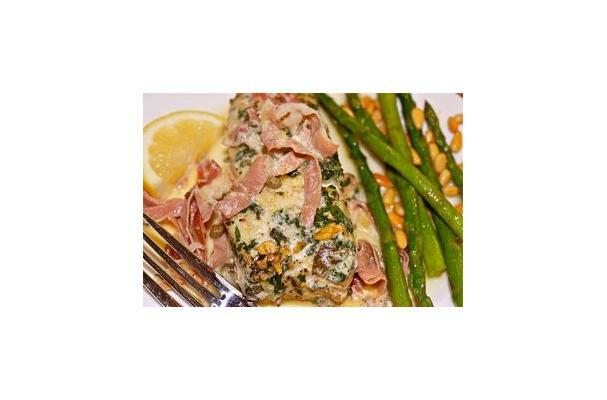 Pour the prosciutto cream sauce over the fillets and serve with a beautiful green vegetable!